What is the Deeper Meaning of Easter? The feast of Easter is observed primarily with images of bunnies, chocolate goodies, beautiful flowers, colorful new clothes, and for millions, a once-a-year visit to a church service. Few contemplate seriously the meaning of Easter beyond its outward observance. So let us step back and take a few minutes to consider the meaning of Easter to our own lives. For starters, let us acknowledge that Easter is inextricably linked to the tragedy of the crucifixion. This is the way of the world where light alternates with darkness. But it’s deeper than that because, for one thing, the crucifixion was not a tragedy except in a very human sense, and for another, the resurrection of Jesus Christ has far more significance to us personally than its simple (if dramatic) narrative would suggest. Jesus’ resurrection represented a victory: a victory over physical death; a victory over those who condemned him to death; a victory over those who accused him of blasphemy for affirming his own divine nature; a victory over those who doubted or scorned his legitimacy as a spiritual teacher. But that victory could not have been a reality were it not for his crucifixion. It is not necessary to believe the story of Jesus’ resurrection to distil meaning from it. By contrast, it is not as difficult to accept the reality of Jesus’ crucifixion! But let’s see them as symbols for realities in our own, personal lives. The ever-present and timeless message of these dramatic events is that the “death” of selfishness and egoity is the price of the soul’s resurrection. Egoity and selfishness we are familiar with, but the existence and nature of the soul is elusive to our day-to-day conscious awareness. For most people, the soul is only experienced in peak moments of transcendent joy, unconditional love, or the intensity of sacred experiences. Few people seek ego transcendence as a means to achieve soul-realization because few have awakened to the truth that the soul is the source of finding lasting happiness. This message is the eternal “religion” and it is the core message of the movement known as Self-realization. Meditation is the means to this end. Stilling the natural tumult of our senses and mind reveals the eternal, changeless, blissful light of our soul. Jesus accepted the divine will in accepting the yoke of crucifixion. Prior to his capture by his self-styled enemies, he briefly prayed that this yoke might be lifted. The answer to his prayer could not be granted and he accepted it without resistance. This models for us our response to the yoke of our karma, the suffering that comes inevitably in living life in a human body. Suffering can be physical, mental, emotional or spiritual but we have no need to define suffering. Pleasure and happiness can also find expression in these ways and, however transient, should also be accepted calmly. Only spiritual “happiness” requires no opposite in order to exist because it is our very nature. This has nothing to do with whether we should seek abatement of suffering or the righting of wrongs. It is our ego-instinct to deny or repulse (or, for pleasure or happiness, our instinct to grasp) that creates the pendulum of unceasing action and reaction which is called karma. By calm acceptance and by neutralizing the reactive process through daily meditation, we achieve the freedom from all suffering and the state of true joy. This neutralizing process is enhanced by devotion and selflessness. Whatever proper action is dictated by the experience of sorrow or happiness is a separate matter and is not precluded by the fact of our acceptance. The meaning of Easter is also embodied in the acknowledgement of Jesus Christ as a true “son of God.” Not the ONLY son of God, but an avatar: a descent into human form of a perfected soul sent back to transmit to truth seekers the hope, promise and power of transcendence. Other souls, too, such as Buddha, Krishna, Moses, and Yogananda, to name but a few, have come and will return again and again to guide entire families of souls toward the Light. The Easter celebration thus holds a two-fold message for all humankind: the way to lasting happiness lies in overcoming egoity in order to achieve Self-realization; and, that wayshowers such as Jesus the Christ show us the way to live in this world; they stand poised to transmit the power of soul consciousness to those who “receive them.” We cannot achieve the “pearl of great price” by our efforts alone. More is needed to break the cyclotron of ego magnetism with its sheaths of karma which bind us. Easter reflects the universal promise of immortality which is our soul’s true nature. Let us then celebrate this message as it has been embodied in the dramatic events of Jesus’ last days on earth. Throughout history, humanity and its spiritual (and political) leaders have recognized the value of group acts of fasting, mortification, purification and forgiveness. Even in America, since revolutionary times, Presidents have called for such acts in times of war or other need. In India, since ancient times, the redemptive power of purification through acts of discipline and mortification are recognized and widely accepted. Known as yagya, such acts historically acquired a complex ritualistic form in addition to personal acts of prayer, meditation, and purification through fasting and other means. Both Mahatma Gandhi and Martin Luther King, Jr. acknowledged the need and redemptive power of accepting suffering, in effect, taking on karma, for its transformative power not only upon oneself but upon others: indeed, others who deem themselves even your enemies. We express this principle in our own and more positive way in today's culture. We speak in terms of an investment, like borrowing money to go to college or investing in a new but promising venture. But money, though abstract, is traceable in its cause and effect, whereas the good karma of purification is far, far more subtle. Sticking to a healthy diet; the benefits of regular exercise; the long-term value of conscious and respectful relationships: these are simple but accepted examples of the value of delayed gratification for personal benefit. But in these common examples the beneficiary is principally oneself and the benefit is primarily material in nature. Today is Good Friday, the day we commemorate the suffering and death of Jesus Christ on the cross. The sacrifice Jesus submitted to by his death on the cross fits well into this precept of the power of unearned suffering which has been universally recognized by humanity since ancient times. It is not clear how the transference of karma actually operates. In his famous life story, Autobiography of a Yogi, Paramhansa Yogananda describes (at various places in the book) the power of a saint to take on karma. He himself did so in the latter years of his life for the benefit of his disciples. So while we may not know the details of the transference, we intuitively hold fast to its potential and its value. Obviously, Jesus' suffering did not change world history to the degree that all sinning suddenly stopped or that the effects of all sin have been erased. Just as obviously, therefore, Jesus' dying "for our sins" must be understood in a more specific and defined sense. It takes a subtler consciousness to intuit the connection between souls; the power of thought and intention; and the channels that can be created by the laser-like direction of life force energy. In general, modern minds are neither subtle, nor focused, nor convinced therefore of their own power. We deem our thoughts, for example, to be private and without impact upon others. In a higher age, long into the future, humanity more generally will acquire these latent mental powers. Most of us, do, however, experience these connections from time to time though we might not make special note of the incident(s). Tales from ancient India are filled with examples of how a person goes off to the Himalayas to meditate for twelve or more years in order to acquire the power (called a "boon") granted by a divine source (a deity or saint) to accomplish some worthy (or even unworthy) goal. Imagine if the people of a nation, such as America, or India or any nation, came together in prayer, fasting, and other forms of self-sacrifice for the benefit and welfare of some noble goal or in asking forgiveness for its own errors! Unfortunately in today's consciousness only lip service would be paid to such a call and not likely would sufficient numbers gather sincerely to do so. Our leaders have forgotten this principle in their efforts to win elections and secure the power for their own agendas. Gone seems to be the understanding of compromise, when each side gives up something they hold dear in order that a greater good can be achieved. The glory and triumph of the resurrection of Jesus is inextricably linked to his sacrifice on the cross. Even professed Christians tend to miss the connection, viewing his resurrection, as is common, as simply a miracle or grace of God. To advance spiritually and to help others spiritually requires sacrifice. This is known as tapasya in Sanskrit and in the tradition of India and the practice of yoga. Energy begets energy and energy directed towards a goal generates magnetism to enlist a greater power which is the ultimate key to success. As we celebrate Easter, then, let us not forget that life asks of us self-offering into a higher purpose than ego gratification. This is the universal law of life (one form offering itself into another) from which comes the sunshine (the sun burning its fuel up), the rain (the clouds dispense their water), and perpetuation of life itself. Soldiers sacrifice their lives for their country; parents sacrifice for their children; inventors sacrifice to create new and useful products; devotees pray for others; the masters come into the world, voluntarily taking on the suffering inherent in human life, to uplift souls who are ready and receptive. On and on the eternal wheel of birth, life, and death. We were not born for our own gratification but to offer ourselves, like Jesus, onto the cross of dharma, for the good of our soul and for the good of others. My dearly departed mother counseled her children at times of pain or discomfort, to "offer it up." This is the hidden message of Easter: the light from the East comes to those who offer themselves up for a greater good: the bliss of the universal Christ consciousness that resides at the heart of every atom. Good Friday Reflection: Did Jesus Die for Our Sins? This question is among those that challenge established dogma: not just in religion, but in science, art, culture and business, we find little " 'ism's" or cliches that get repeated down through generations (or even centuries) that gradually lose touch with their original or deeper meaning, if indeed, they ever had such! Yet even in this seemingly absurd but oft-quoted dogma there lies a mustard seed of truth: great saints of the stature of Jesus Christ are said to take on the "karma" (translate: "sins") of their close disciples. Just as a rich parent can pay off the debts of his wayward (but presumably repentant) son, so a great saint can take some of the burden of a disciples' karma, or so it is taught in the yoga tradition. Now, a paradox here, too, is that it is the "good karma" of a disciple to have this burden lifted! Good karma means the disciple has put out effort of the type that would have this result!!!! St. John, the beloved disciple, wrote in Chapter 1 of his gospel a famous statement oft quoted by Paramhansa Yogananda (author of "Autobiography of a Yogi"): "As many as received Him, to them gave He the power to become the sons of God, even those that believe on His name!" Whatever the meaning behind becoming a "son of God" may be, it is clear that a powerful grace or blessing attends one who "receives" the guru. By "receive" must be meant to be open to the teachings, the guidance, and the vibration and consciousness of the guru, and, where and however appropriate, to serve the guru's work. Do you see, now, how each of these phrases is fraught with deeper meaning even if the words are simple: "die for our sins"....."take on the karma"........"receive Him".........simple words but not necessarily obvious meanings. Let's take this further in what seems the direction of absurdity: can I "receive" my Lord and Savior (i.e. guru, whether Jesus Christ, Buddha, Lord Krishna, Yogananda, etc.) AFTER the time in which he (or she) lived? What does it mean "lived?" Mystics down through ages report the living presence of great saints and masters long after their passing. Some are reported to have resurrected their former bodies, whether in vision or in flesh! Christians pay reverence and worship to Jesus Christ two thousand years after his life on earth. They have no problem praying to Jesus today; nor does a devout Hindu to Lord Krishna, etc. etc. So, we must conclude that, to them, YES: I can still "receive Him"and thus I can still be a recipient of divine grace through my attunement: by following in His footsteps and teachings. Have you noticed "the catch-22" yet? To be "saved" (whatever that means) you must "receive Him." The phrase "even those that believe on His name" certainly suggests a fairly easy pathway to salvation. Is there, then, a "free lunch" here? Are the loaves and fishes of grace miraculously multiplied and distributed? Let me digress (just for a 'minute'): Paramhansa Yogananda taught that true baptism takes place when our consciousness is uplifted into God consciousness. This isn't the only form of "baptism," but for my purposes it is the essence of what he taught on baptism. In "yogi" terms this is translated to say that when we enter a state of superconsciousness (a feat achieved not only with devotion and right action but specially enhanced by the science of advanced meditation techniques, such as kriya yoga), we experience a kind of temporary baptism. Repeated dunkings into the River (or Tree) of Life in the astral spine gradually deepens and renders increasingly lasting (and eventually permanent) our attunement with God. As God comes to earth through the human vehicles of souls like Jesus Christ who are sent and who have become God-realized ("one with the Father"), it is God, then, who gives to us the teachings and now, in this age, the science of yoga by which we can accelerate our path to freedom in God. Thus to "receive Him" is really meant to be uplifted into and toward God-consciousness. Our effort, it has well and often been said, is met by an even greater effort by God to reach and uplift us. Yogananda gave this mathematical formula of 25% our effort; 25% the effort of the guru on our behalf; and 50% the grace of God. And yet, even having belief (hopefully leading to true faith) in the living God in human form ("in His name") brings some grace...according to St. John.....it is, potentially at least, a beginning. The point here, and in every tradition, no matter how differently or vaguely expressed, is that we are "not saved by effort alone" but by grace. But both are needed. But as the power of God required to manifest this universe is far, far greater than our own, and as we did not create ourselves, so too our effort can never be but a portion of the total energy required to free us (from our past karma; our "sins"). Did Jesus DIE for our sins? He certainly didn't "deserve" to do so!!! If he hadn't "died for our sins," would He be powerless to uplift us, then, or now? 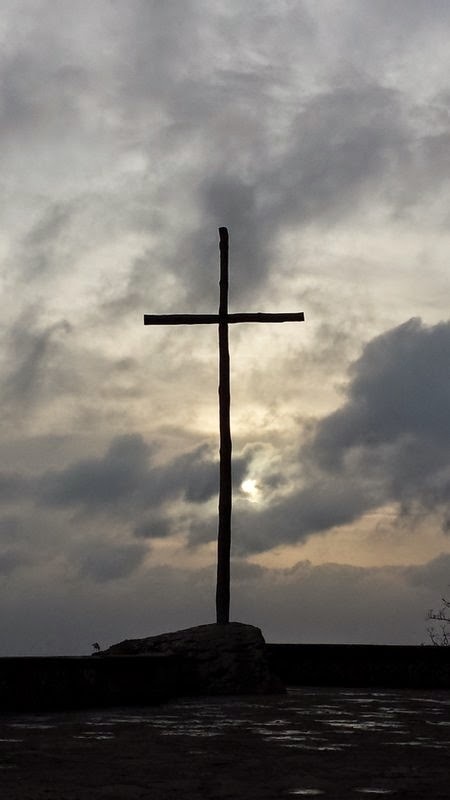 What, then, is the connection between His crucifixion and our "resurrection?" Why didn't Buddha die for our sins? The night before his death, he prayed, briefly, that the bitter cup of his death be taken, but he immediately affirmed "Thy will be done." By this he showed us he was not a God-made puppet, but flesh and blood. 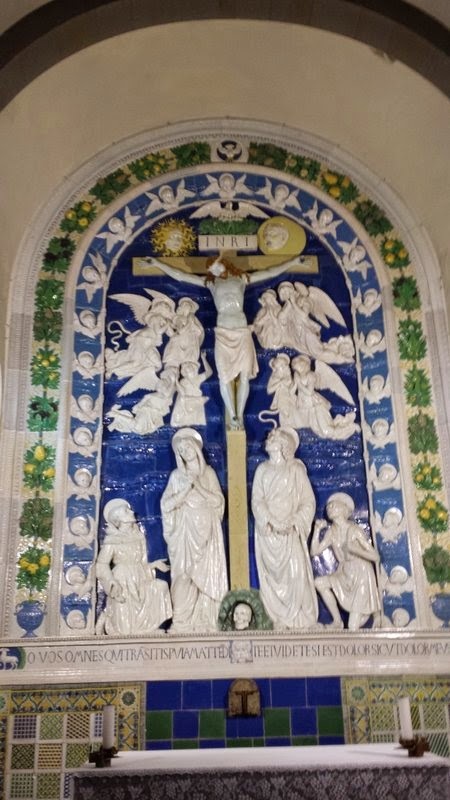 When he called out from the cross, "Elias, why have you forsaken me," he showed that he, too, could, however temporarily, experience the separateness from God that is our own, deepest existential form of suffering. Neither his prayer for relief nor his cry of loss of God-contact suggest that he was any less than a God-realized soul. Rather, it shows that those great ones who have achieved Self-realization sacrifice, to a degree, their hard-won God-bliss by taking on human form. By this act, they too feel the pangs of human life even as they are, nonetheless, free from past karma compelling their incarnation. This is, as it were, Part 1, of their gift to those with ears to hear and eyes to see. Jesus died on the cross that we might know how to carry our cross and how to overcome our past bad karma--our sins. In that sense, YES, he died to show us the way to be free. But Part 2 is our effort for he, like other avatars (saviors), has the power to lift us if we will but “receive” them into our hearts, minds, daily action and souls. Part 3 is the transforming baptism of grace that lifts and purifies us. When it does we look back and realize that, while essential, our effort was but a small part of the power of redemption. 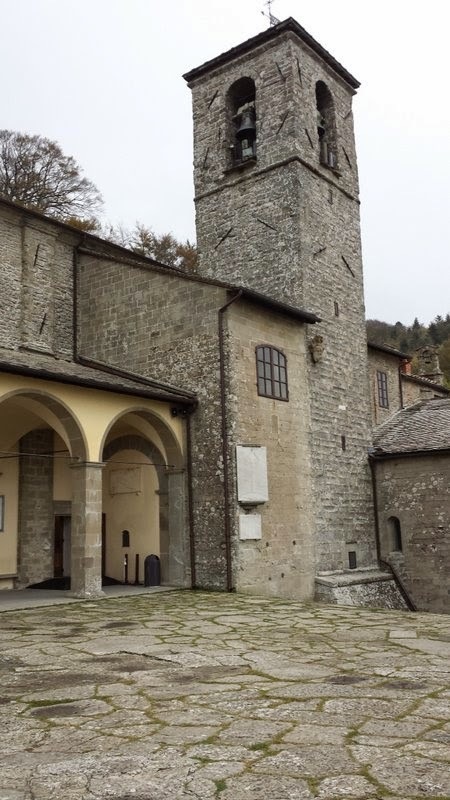 At La Verna, St Francis asks: Must Devotees Suffer? So, now we come to my last blog installment on our trip "In the footsteps of St. Francis." 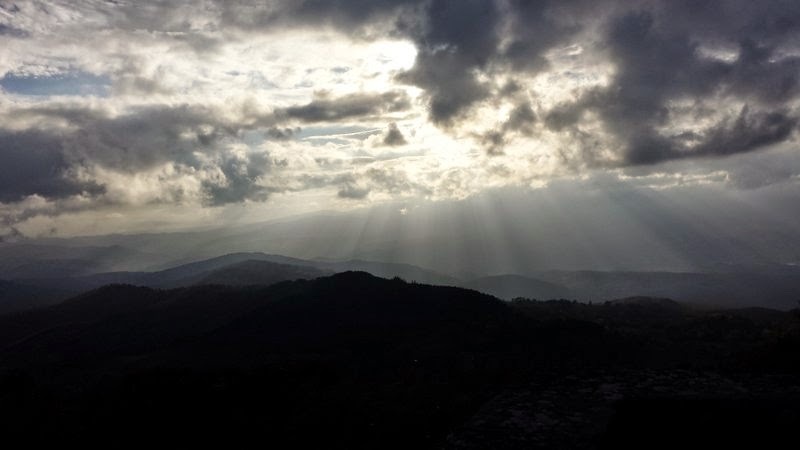 We come, at last, to his hilltop retreat, La Verna, in the Tuscan hills. Two years before his death, St. Francis, while on retreat there, received the wounds of Jesus Christ upon his body. He was undertaking a forty day fast when he had an intense vision in which he simultaneously experienced compassion for the suffering of Jesus on the cross AND great love for Christ and joy in the experience itself. After this, his body was left with the five wounds (feet, hands and side) of Christ. Francis was the first in history to receive this "grace" known as the "stigmata." At another occasion, Jesus Christ appeared to Francis in the flesh and sat with him upon a rock and conversed. 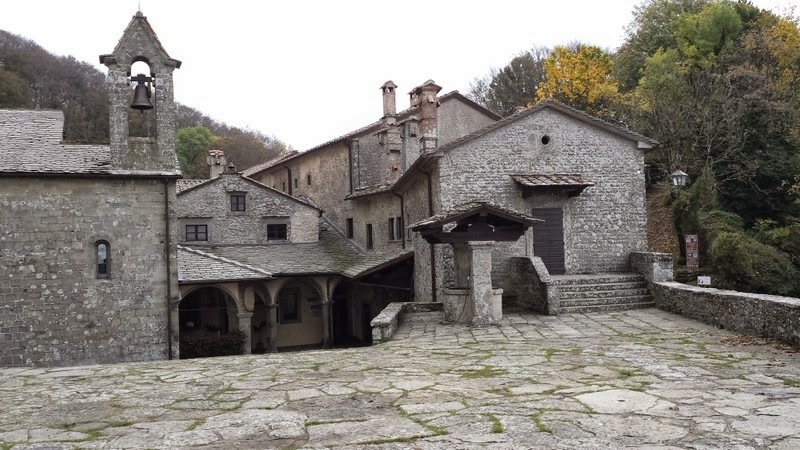 For these, and other, sacred events in Francis' life, La Verna has been a place of pilgrimage for eight centuries. Right before his death and as he left La Verna for the last time, he assigned to the brothers the duty to hold La Verna in perpetuity as a sacred place in memory of the blessings received there. 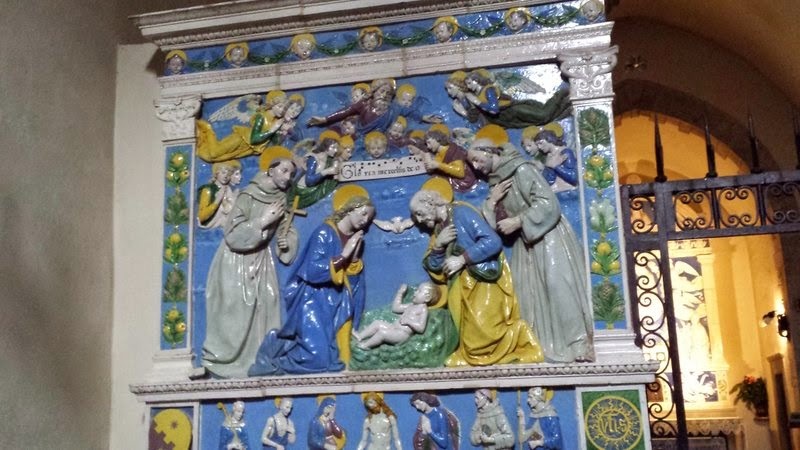 We pilgrims have been progressing deeper and deeper into our souls on this trip: first the fun and inspiration and amazement of Rome and Florence. Then to Assisi, to Ananda, and to the shrines there. And now, in our final days on this trip, we had two nights on these sacred grounds. The two nights allowed us to dedicate an entire day in silence, unscheduled, that we might individually go deep in prayer, meditation and contemplation. It is here that the metal of our journey's intention would be burnished in the flame of devotion and inner communion. It was to be here that the stigmata of our spiritual efforts would be imprinted upon our hearts, tested in the crucible of inner silence. I cannot, of course, speak for other individuals in this but for those who saw the opportunity for what it was -- the apex or focal point of concentration for the intentions of our pilgrimage -- it was a golden, if intense, time. Perhaps some did not find it necessary, but surely some felt hovering over them the reflection of St. Francis' life in the mirror of our own. His complete, indeed radical, commitment to God cannot help but expose our own to inner review. Another challenge hovers, too: must we, also, carry such a cross of self-abnegation to achieve Self-realization? Does the spiritual path truly call us, require from us, exact from us such human deprivation as we see in the lives of St. Francis, St. Clare and many others? In such a place where God met man, where the "Word was made flesh, where heaven came to earth, the question begs an answer and anything less is evasion. The gauntlet of our life's purpose was thrown, as it were, in our face, on this mountain of spiritual aspiration. Amusingly, however, visitors are conveniently offered a shield from this inner questioning by the disingenuous fact of large quantities of excellent food served daily -- as if Francis had complained of his treatment there (while fasting) and the monks felt they needed to make amends to all future generations. A bar, too, graces the dining room where not just coffee but alcoholic drinks can be ordered, along with a pleasing selection of candies, chocolates and goodies lest one's retreat be too great a cross to bear! Amazing, eh? "Reality runs up your spine," to quote Elton John! (The Franciscans evidently outsourced the operations to a commercial establishment.) At times, the din in the halls and dining room rivaled the Colosseum! Strange, eh? I even saw an upstairs room marked "TV Room." In another room was a vending machine for coffee and espresso. But we pilgrims didn't come all this way to duck and run. We were not inclined to evade the shadow of the cross. Our strength, however, lie in the "joy of seeking Him," the joy of meditation. We had already been meditating frequently and deeply together and individually throughout the trip, at Ananda and in Assisi. Our joy level was both our shield from self-delusion and our sword of inner awareness. In former times and according to a view of history which Paramhansa Yogananda taught (having received it from his guru, Swami Sri Yukteswar), the time of Jesus Christ and the centuries which we call medieval times represented a low point in a long and recurring cycle (some 24,000 years) of consciousness on this planet. This relatively dark cycle (or "yuga") is called (in India), the "Kali Yuga." In this cycle, the general run of humanity cannot perceive subtleties beyond physical appearances. Buildings are large and made of rock, built with human hands, by slaves. Social mobility is non-existent. Authority is absolute. Humans identify themselves only with their physical bodies and thus imagine that if there's a heaven they will go there in their current physical bodies, forever an ego and separate from God, strumming harps and praising Him for an eternity! God responds to human needs according to the capacity of our "eyes to see and our ears hear." Thus, in an age of such relative dark consciousness, Jesus' body had to be resurrected as a sort "ultimate" proof of his divinity; the penultimate mark of sanctity became the incorruptibility of the saints' bodies; physical suffering came to characterize the spiritual life. To be spiritual required rejecting family life in favor of a monastery; it required celibacy and living in poverty under strict obedience. One would practice all manner of physical and mental austerities such as self-flagellation and self-abasement to suppress sense temptations and root out any ego-active tendencies. These attitudes and practices no longer inspire sincere seekers of truth, devotees of God, and servants of humanity. Fact is, and using, as we must, St. Francis as an example, he was a saint of great joy, as, indeed, are all true saints, east and west. He had a wonderful sense of humor and was (and is) loved by all because he loved all as children of God. Even Jesus Christ, so often depicted as a "man of sorrows," could not have attracted a large following with a sour and somber attitude. "A sad saint is a sorry saint, indeed" said Francis de Sales (a Christian saint). Or, as Teresa of Avila put it, "A sad nun is a bad nun!" "What comes of its own, let it come" Paramhansa Yogananda counseled. In this new age, called the second age, Dwapara Yuga, an age of high energy, intelligence, and expanding consciousness, it is happiness (joy) that we seek. We see our potential; we have faith in ourselves, and in the future (because we are in now an ascending cycle of consciousness where things can only get "better," or so we are wont to affirm). It is joy that inspires us. And yet, when pain, disappointment, failure, suffering, or death touch us, as they must at some point, our joy, if it is true and of the Self, will allow us to remain "standing amidst the crash of breaking worlds." The test of the crucifixion, of human suffering in general, is whether it crushes us, or whether we can transcend that temptation by remaining even-minded, cheerful and calmly holding on to our faith in the goodness (God-ness) that lies at the heart of all creation, and of all circumstances. Easier said than done, I grant you, but this is not only a test of spiritual path but it is the only way to live and remain sane! We can, therefore, honor and celebrate the victory of Jesus' resurrection (the power of love) over hatred (crucifixion & death), the victory of martyrdom (a test of faith and courage) over persecution (misunderstanding), and the attainment of perfect joy in the midst of troubles because we know that "joy is the fruit of love for God." We may, now in Dwapara Yuga, be motivated not by the courage and strength to endure difficulties in the imitation of Christ, but for the bliss and joy inherent in God and in the superconscious state of our soul. For this we undertake the discipline of meditation, the willingness to serve high ideals selflessly, the commitment of living simply and with self-control, and a life of prayer and devotion. But for all of that, so, too, will come tests and trials. In pleasure or in pain, we remain: even-minded and cheerful! Oh, gee, did I mention La Verna, yet? I'll plop some pictures into this soon, but let me return to earth with some descriptions. 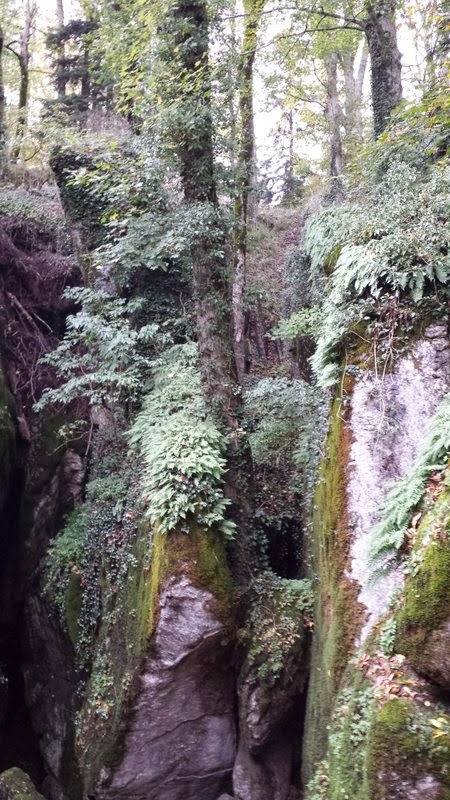 La Verna is somewhere between Assisi and Florence in the Tuscan Apennines, at about 4,000 feet altitude on the flanks of Mt. Penna. It's not difficult to get to but you're talking winding country roads, beautiful countryside, and not too far from a nearby autostrada. I doubt there's public transportation to it, but we had our rented vans, so I don't really know. The complex of buildings and facilities, though somewhat hidden in the lovely forest, is surprisingly large. I was told of another complete complex of buildings with lodgings apart from ours. 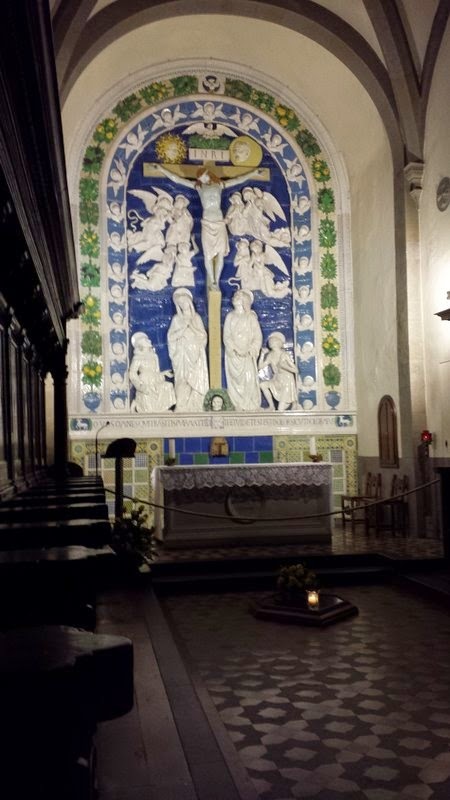 But ours is at the center of the important chapels and shrines. 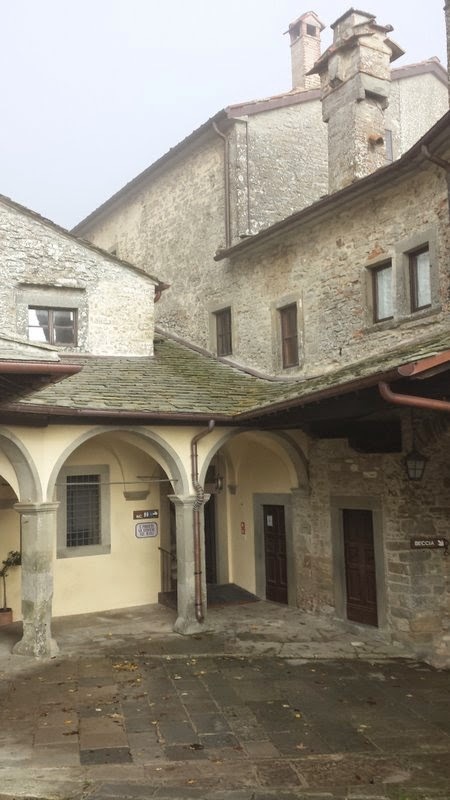 These buildings are of stone and are of a monastic origin and design. Labyrinthine hallways, with arched ceilings in the gothic style, weave to and fro, with staircases going up and down and all around; courtyards appear from nowhere, whether inside the four walls or outside. There is a maze of rambling and mysterious rooms, many with locked, heavy wooden doors, closed to our natural curiosity but open to our fertile imaginations. Nuns and monks can be envisioned darting furtively in and out of secret rooms, setting, as it were, the stage for a classic Agatha Christie novel! One is prepared to hear voices from locations untraceable. Add a heavy dose of fog and, all in all, it's quite a place!!!!! 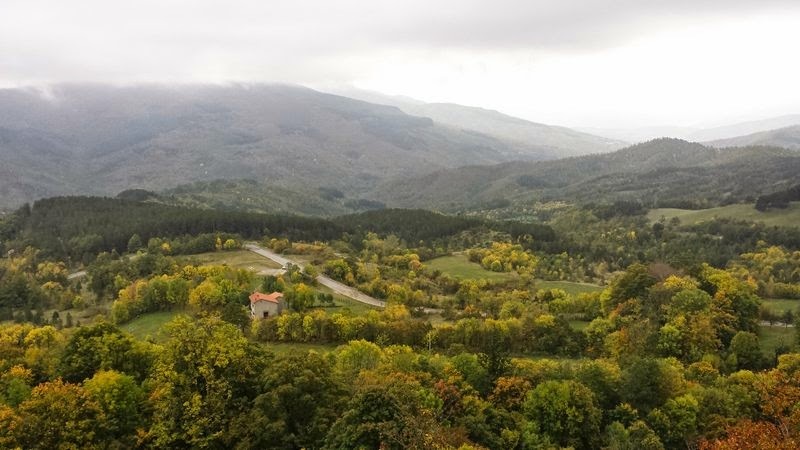 There's a patio, plaza or piazza outside the mini-Basilica that overlooks the Cosentino Valley, which at our visit, was beginning to unveil the lovely colors of Fall. Overlooking that valley, as if to remind, chastise, or inspire the villagers below, stands a very tall, but stark, wooden cross. 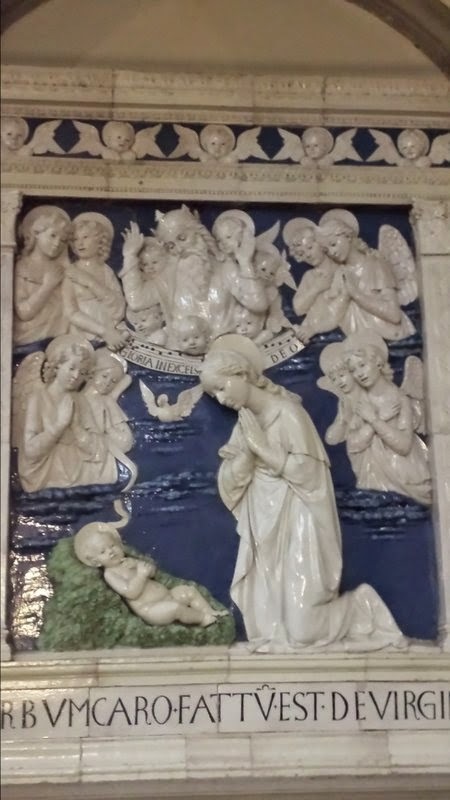 The basilica has a number of lovely art pieces by Andrea della Robbia. Adjacent to it is a small chapel (St. Mary of the Angels) which, in a vision, St. Francis was told by the Blessed Mother to build. He was given its dimensions which were exactly the same as that of the tiny chapel of the Porziuncula near Assisi. Its walls contain the choir seats for monks and nuns: there are no pews. I meditated there, and we as a group, several times. It is very still and deeply precious. The most sacred spot is the Chapel of the Stigmata. It encloses the rock on which Francis received the stigmata. The rock has been covered by glass to prevent pilgrims from chiseling pieces off of it! A slightly hidden room off to the side contains within it a jutting segment of the actual rock. If you are bold, you unhook the rope and try the latch to see if it's unlocked, going inside to meditate and pray. The Stigmata Chapel also has the wooden choir seats along the sides. This is where you want to meditate, for sure! I, and others, found, that despite there being plenty of visitors and retreatants on the grounds at large, one could meditate there all by oneself for, say, an hour or more with no one else there! 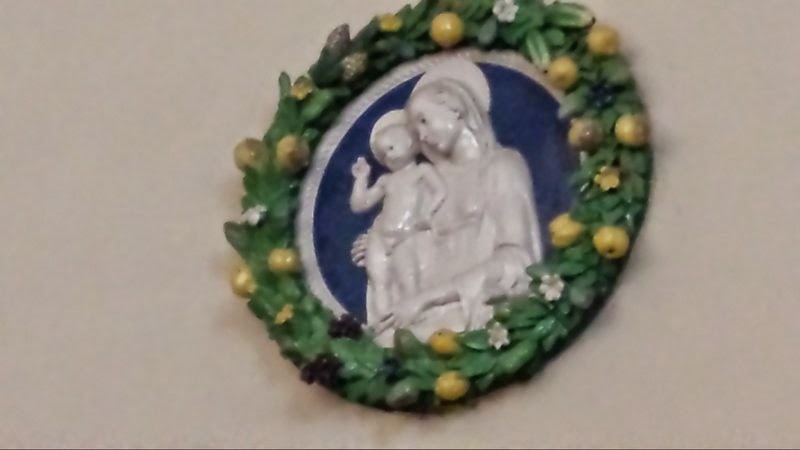 I cannot begin to describe that experience but I prayed for the strength to remain unceasingly in self-offering to God's presence and will in my life; and, to go ever deeper towards God's love and joy that I might share with others as I have received. On the outer perimeter of the Stigmata Chapel are tiny cells (now tiny chapels) where various saintly monks had once lived. One door leads out along a rock ledge perched high up on the edge of the rock on which the building sits. It winds around the outside wall giving spectacular views before returning inside through an almost secret chapel. Fortunately, there is a hand rail but it's a straight drop down to the forest below! It is positively and stunningly breathtaking. A long covered hallway protects pilgrims walking from the basilica to the stigmata chapel. 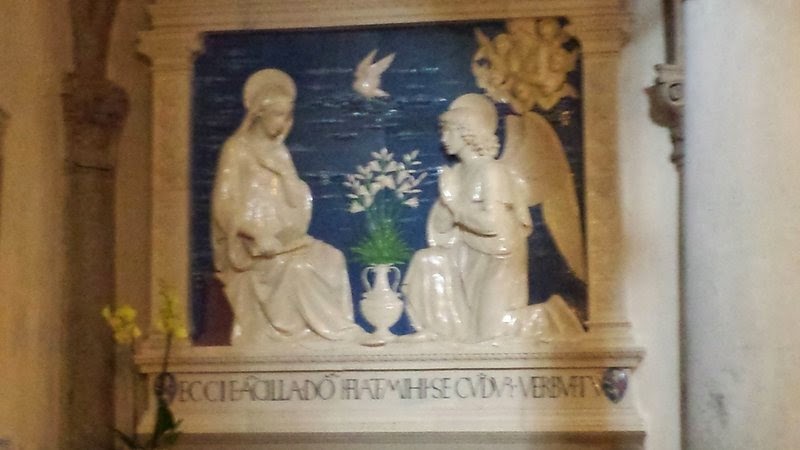 It has murals depicting important events from Francis' life. Along the wide passageway there is a tiny doorway that opens into an inner courtyard of giant rock formations. 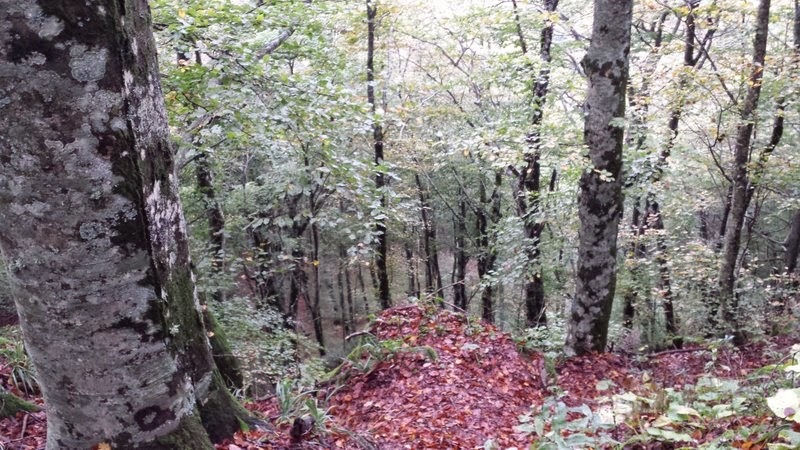 The path leads a few yards down under some of these huge boulders to a spot where Francis was known to sleep. A grate has protectively been placed upon the spot: again, to protect it from relic hounds. But, wow, the energy there is enormous and the silence is as thick as the rocks themselves. Across from the basilica doors and down some slippery stone steps one finds another, somewhat primitive domed chapel -- the Chapel of Mary Magdalene -- maybe twenty feet in diameter; a few crude wooden chairs have been placed in there. 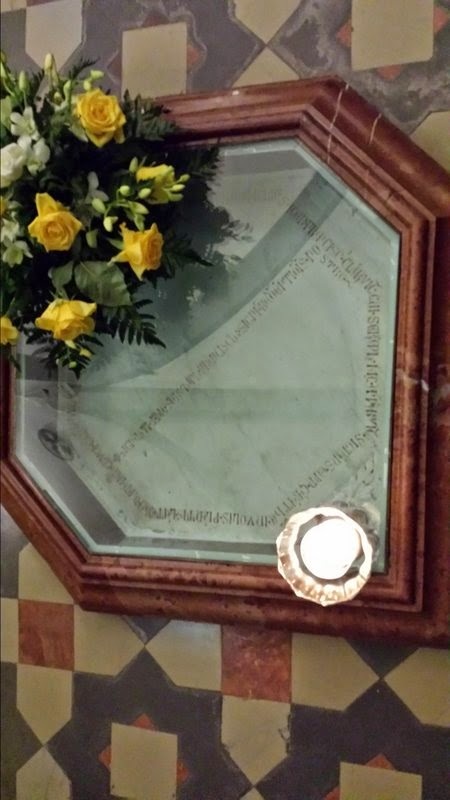 The stone altar contains, under glass, the stone where Jesus sat, in the flesh, talking with Francis! Like: wow! We had two group meditations there and I meditated there on my own as well. It's almost, well, spooky, especially late at night when the wind is howling! If you follow the steps past the path to this chapel you go down amidst another group of gigantic rocks called the Sasso Spico: the Projecting Rock. Here is a place where Francis prayed and meditated. 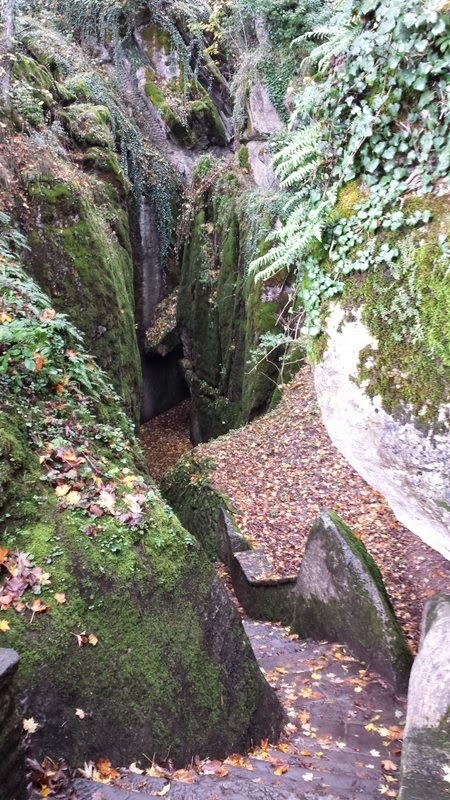 One time, while meditating on the passion of Christ, it was revealed to Francis that the dramatic rock formations and chasms of La Verna were created at the time of Jesus' crucifixion as indicated in the New Testament: "the rocks split" (Matt: 27:14). Who knows, but as many believe that there are on the earth "power spots," it is not so difficult to imagine that La Verne was destined to attract and hold the sacred vibrations of St. Francis' spiritual glory. A simple wooden cross marks the spot, under the overhang of an enormous rock, where Francis would pray. When I was there, I saw no one. With the wetness of fog and drizzle dripping off the rocks and ferns, I settled in for a very deep meditation where no footsteps or outer sounds dare intrude! I did find some free time to hike up Mt. Penna through the forest. This is more primitive, though friars did meditate and live up along parts of this, too. It is a solitary walk, very peaceful and entrancing in its colors of green, brown, yellow and red; its carpet of leaves, its ancient, gnarly roots, intertwining the path like some aged and great snake. On our second night, after dinner (when we broke our silence to share a little bit), a storm descended upon us with blowing, cold fog and rain. Fog hugged the outdoor lights and the feeling of antiquity and mystery came upon the place like a kind of "Twilight Zone," a kind of alternate universe without tick, tock or clock. 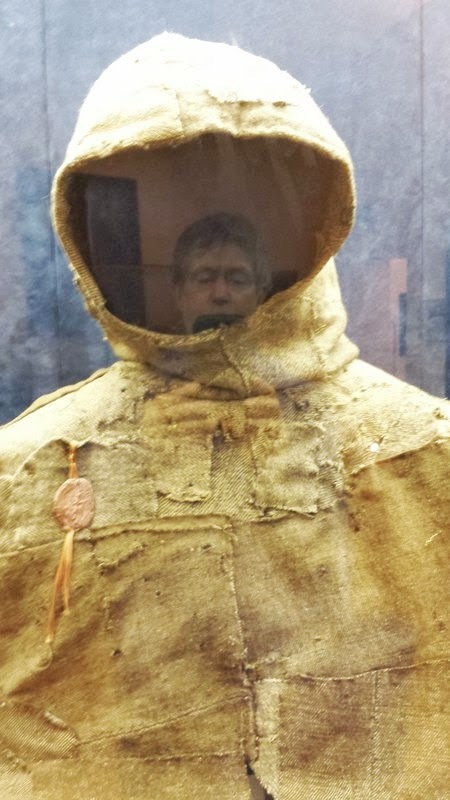 I attempted to brave the elements and find thrill in the the storm by going out after dinner for a walk but with the wind and rain, blowing sideways, I could barely stand and my thin Fall apparel seemed to melt into my skin. I meditated briefly at a tiny chapel lit only with candlelight but as I had heard stories of being locked out of the facility and having to stay outside overnight, my "second thoughts" returned me to my room. The whole place was "dead" silent. All had returned to their rooms after dinner. Early the next morning we were supposed to meditate in the simple stone chapel of Mary Magdalene with the rock where Jesus appeared but the storm was so intense, the fog so thick, that we decided to move the morning meditation to the chapel St. Mary of the Angels. After breakfast and after checking out, we were going to allow ourselves more time to be there but the weather was so inclement that we packed up the vans and headed south to Rome. By late afternoon we were at the seacoast of Ostia (near Rome and the airport), relaxing in the warm, humid Mediterranean air, watching a glorious sunset, before having dinner outside at the waterfront under the stars: pizza, salad, pasta and laughter born of open hearts. All in all, we were refreshed in body, mind and soul! It was difficult to contrast the morning wind and fog with the afternoon beach weather and view. Thank you for hanging in there with these articles. Stay tuned for future pilgrimages! Here, then are some pictures! May the stigmata of your victories over delusion be your badge of soul-honor!